The Anderida Gorsedd is a big part of Damh’s and my lives, and since spring equinox 2000 we have run eight seasonal festival rituals a year at our local sacred site the Long Man of Wilmington in Sussex, and since 2003 two camps per year as well as the Anderida Gorsedd message board. 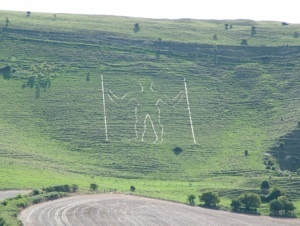 The above photo is of the Long Man, in the bottom right of the picture you can see a small flat hill, which is where we hold the rituals. Above his head on the top of the hill you can see bumps and mounds, these are all burial mounds and the remains of Neolithic flint mines. It is wonderful to feel the ancestors all around us as we stand on the little hill. The land is farmland but also access land, which means that there are often members of the general public walking past or watching the ceremonies from the top of the hill. People are far more respectful and interested than you would imagine. We have meet some wonderful people over the years who just happened to be walking past knowing nothing about the ceremonies, such as a Peruvian Shaman, Buddhists and a number of others that just happened by and joined in with us, pure magic! The Facebook page, rituals and camps are open to all spiritual paths and there are people who come together from all over Britain (and occasionally from other countries) to meet up and celebrate with like minded folk. The Gorsedd is not a group with a specific membership as such, though there are a good many people who come regularly to some or all of the events. It is more the draw of being with others who share a similar out look and being able to share a deep experience in a safe space. The camps we hold on an Organic Farm in Sussex. The farmer is a very groovy guy who seems to enjoy us using his land for the things we do. He has gotten used to the fact that we are habitual pyromaniacs and generally asks us what we intend to burn this time when we start the conversation with “errm, Crispin….”. Once we wanted to try to get some wolves to the camp, there was a wolf sanctuary who used to take a couple of wolves with a large enclosure that you could walk in and sit with the wolves. Crispin’s response to the “errm Crispin….” was “you want to bring wolves onto a sheep farm?… Ok as long as my kids can come down and see them.” What a legend he is! As it happens the wolves couldn’t come which was a shame. The fields we use for the weekend camps are in the middle of the farm so are very secluded so we can really let ourselves be totally immersed in the rituals and energy of the camps. We have been putting on the camps since 2003 and they work on the principle of small is beautiful. Each camp has a focused theme and runs from a friday afternoon until Sunday afternoon. The camps follow a simple structure each time. On the Friday people start to arrive, we open with a ceremony called “beating the bounds”. This entails going to each of the four directions, beating drums and pots and pans, and generally making a hullabaloo. At each quarter we invite the spirits of the four directions to be with us and bless the weekend. Then we often have a musician/s to play a small concert in the evening and then we go around the central fire for more singing, story telling and merriment with the wonderful collection of creative Bards that attend the camp. On the Saturday morning one of our number will organise a “dance of life” , then we usually have a speaker to give a talk based around the theme of the camp, a workshop in the afternoon, all of which builds to a big ritual on the saturday evening, which begins around 8.30pm and often goes on until 11.30pm, then it is back around the fire until the early hours for more songs and merry making. Then the Sunday is a morning gathering to make sure everyone is grounded from the night before, a closing ceremony and a chilled out breaking down of camp. The first camp that we ever put together was a great experience it was probably the most simple camp that we have ever put on. We had around forty people plus children with a fire labyrinth and it was so amazing to be able to build and walk through it, for all of us it was a powerful experience. This labyrinth was around forty feet across and it is not a traditional labyrinth as there is a way out from the centre. This is for safety reasons when you have up to forty or fifty people walking through, you need them not to bump into each other. We have since done a number of labyrinths the last of which was about one hundred feet across! Over the years the camp rituals have become more involved and the energy more intense with each one. We have worked with many shamanic Imramas (spiritual journeys) such as the Bulls hide trance, a firewalk, the Wickerman, Death and Rebirth, Fairy realms and King Arthur to name but a few. We have always tried to include everyone in the rituals who wanted to be in them, whether they want to journey or to help facilitate the journey, and that includes any children that wanted to be included as they are an integral part of our lives. The children have played various roles such as tricksters trying to throw people off their track with questions or tasks, or guides to send the journeyers in the right direction, and they always take their responsibilities very seriously and have great fun too. Obviously with things such a fire walk that is something that little children could not do, and the labyrinth they have to be accompanied by a sensible adult. It is interesting that the children have often been the ones to inspire the adults to do things that they are afraid of. One example of this was at the first labyrinth. One man was not going to go through, he had a deep fear of fire and just being near it was a big challenge for him. However there was a five year old with his Mum near him and he heard the child say to her, dont worry Mummy I will look after you. The little lad so impressed him that he felt able to face one of his deepest fears and was profoundly moved by the whole experience. We are very lucky to share these events with wonderful people with open hearts, and a willingness to enter fully into what ever we can dream up to put them through. It has been, and I hope will continue to be for many years to come, at complete privilege to do these things.